At Heidelberg Engineering, we strive to provide our customers with products of the highest quality that feature the latest technology. As such, we are continuously working to improve our platform and optimize its performance by delivering periodic updates to your SPECTRALIS software. With each new software release, we introduce new features designed to enhance your SPECTRALIS experience. SPECTRALIS Software 6.12.1 introduces a quality check page, which displays OCTA scans immediately after acquisition. At a quick glance users can decide to keep or discard images, enabling a faster and more efficient experience for both the photographer and patient. high-resolution OCT B-scans and relate this information to correlating 10-2 and 24-2 visual field points. The ability to set All Layer segmentation as the default for volume scans will facilitate reduced processing time and simplify report generation, allowing clinicians to seamlessly access patients’ GCL or RNFL data. Users are able to customize their segmentation preferences and additional print report options directly within Heidelberg Eye Explorer. 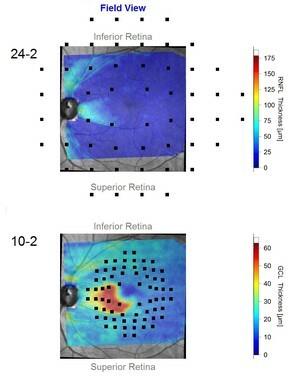 A portion of the GMPE Hood Glaucoma Report shows visual field points marked on cSLO thickness maps. Login is required to access the software. If you are not yet registered on our Business Lounge, please create an account. There is no charge for this service or this software. New SPECTRALIS software versions are no longer validated for the Windows XP operating system. If you have a device operating on Windows XP, please do not install this software. Contact our Customer Care team at 800-931-2230, option 1, to inquire about upgrading your system. Additionally, due to the many advancements that have been made in recent software releases, SPECTRALIS software versions below version 6.0 are no longer supported. Heidelberg Engineering highly recommends updating all acquisition and viewing stations to the latest version of software to ensure optimal performance.